Having to prepare for Halloween activities for kids at their school can easily mar the frightfully fun festivities for any parent. If you are searching for kid-friendly party snacks to share with your kids classmates, you’re at the right place. While experienced parents often joke that you can turn any kids friendly food into a Halloween special simply by adding eyes, teeth or plastic spiders. However, you definitely don’t want to embarrass your kids in front of their schoolmates by not bringing in something that really causes a stir! Get your kids excited about Halloween with some of these delicious and somewhat healthy foods for school Halloween parties. You might find that these foods make a refreshing change from sugary candies and sweets. 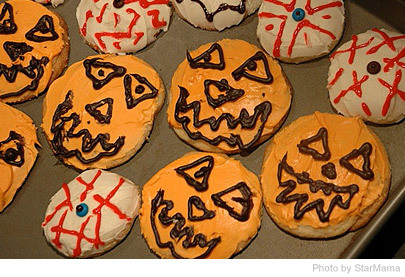 Get ready to whip up some creepy yet easy Halloween party foods and watch your kids scream... with delight! Creamy carrot fingers - Fill a serving bowl with your child’s favorite dip (hummus, ranch, herb dressings, etc) and stick in 4 long (washed and peeled) carrots for fingers and 1 medium-sized carrot for the thumb. Cut a shallow notch at the tip of each carrot and “glue” an almond fingernail atop with a dab of the creamy dip. Have plenty of baby carrots near by for snacking. Kids won’t be able to keep their hands out of this easy Halloween party food! Apple-jawed monsters - Cut quarters out of apples and remove a wedge from the centers of each quarter. Add toasted slivered almonds for teeth and candy eyes with peanut butter for that added ghoulish effect. Stick in some pretzel rods to create the perfect Halloween party snack! ©2005 Some rights reserved. Licensed by Creative Commons Public Works License. Dirt Cups - Make chocolate pudding and add some crushed Oreos on top. Conceal some gummy worms and hey, presto! Your dirt and worms are ready for the ewwws and aahhhs! Now wasn’t this easy Halloween party food? Super slimy worms in a bun - Slice hotdogs and dip in boiling water for a couple of minutes until they start curling. Put them in bbq sauce and place between buns and voila! The sauce will help make the hotdog look like a creepy creature, yet still taste delicious. Monster carrot eyes - Cut 1 inch carrot stubs and decorate them with half a pitted black olive and ½ teaspoon of cream cheese. Healthy, delicious and oh so monstrous easy Halloween party food!